Kyle Grillot - kgrillot@shawmedia.com during the high school football game at Cary-Grove High School Friday October 18, 2013. Cary-Grove won the game 21-14. 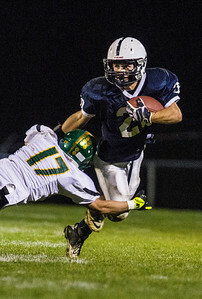 Kyle Grillot - kgrillot@shawmedia.com Cary-Grove junior Matt Sutherland escapes Crystal Lake South senior Casey Oliver's tackle during the third quarter of the high school football game at Cary-Grove High School Friday October 18, 2013. Cary-Grove won the game 21-14. 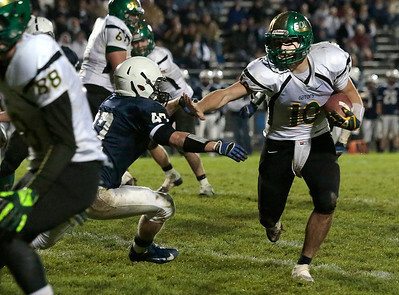 Kyle Grillot - kgrillot@shawmedia.com Crystal Lake South senior Austin Rogers runs the ball for a first down during the fourth quarter of the high school football game at Cary-Grove High School Friday October 18, 2013. 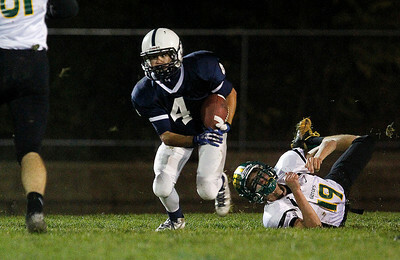 Cary-Grove won the game 21-14. Kyle Grillot - kgrillot@shawmedia.com Crystal Lake South senior Austin Rogers bobbles the ball out of bounds during the during the high school football game at Cary-Grove High School Friday October 18, 2013. Cary-Grove won the game 21-14. 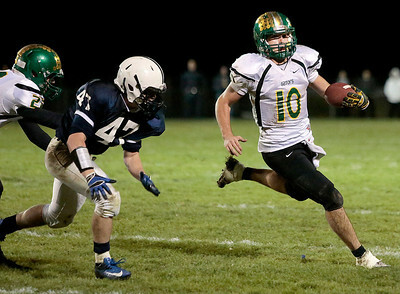 Kyle Grillot - kgrillot@shawmedia.com Cary-Grove junior Larkin Hanselmann (4) outruns Crystal Lake South junior Joey Ahsmann (19) during the high school football game at Cary-Grove High School Friday October 18, 2013. Cary-Grove won the game 21-14. Kyle Grillot - kgrillot@shawmedia.com Crystal Lake South senior Austin Rogers (10) catches a pass for a touchdown under the defense of Cary-Grove senior Matt Hughes (38) during the second quarter of the high school football game at Cary-Grove High School Friday October 18, 2013. Cary-Grove won the game 21-14. Kyle Grillot - kgrillot@shawmedia.com Crystal Lake South team warms up before the second half of the high school football game at Cary-Grove High School Friday October 18, 2013. Cary-Grove won the game 21-14. 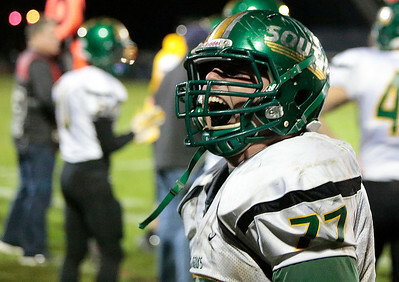 Kyle Grillot - kgrillot@shawmedia.com Crystal Lake South senior Vinny Atella celebrates after his team recovered a fumble late in the fourth quarter of the high school football game at Cary-Grove High School Friday October 18, 2013. Cary-Grove won the game 21-14. 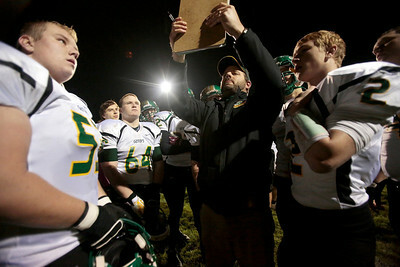 Kyle Grillot - kgrillot@shawmedia.com Crystal Lake South offense prepares for the second half of the high school football game at Cary-Grove High School Friday October 18, 2013. Cary-Grove won the game 21-14. 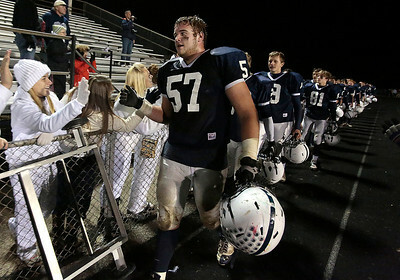 Kyle Grillot - kgrillot@shawmedia.com Cary-Grove Junior Trevor Ruhland leads his team in greeting fans after the high school football game against Crystal Lake South Friday October 18, 2013. Cary-Grove won the game 21-14. 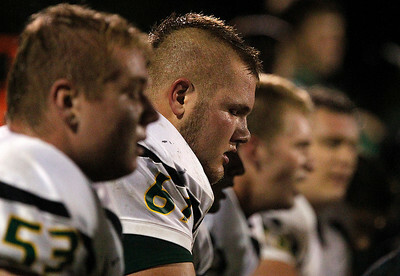 Kyle Grillot - kgrillot@shawmedia.com The Crystal Lake South defense takes a moment on the bench last during the fourth quarter of the high school football game at Cary-Grove High School Friday October 18, 2013. Cary-Grove won the game 21-14. 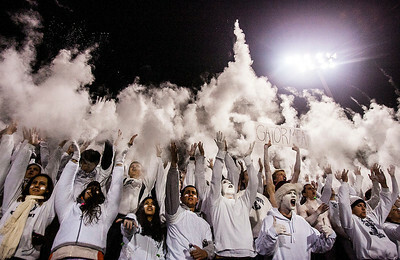 Kyle Grillot - kgrillot@shawmedia.com Cary-Grove fans throw powder into the air at the start of the high school football game against Crystal Lake South Friday October 18, 2013. Cary-Grove won the game 21-14. 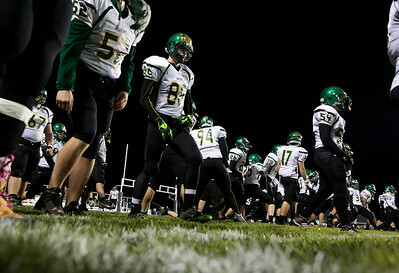 Crystal Lake South team warms up before the second half of the high school football game at Cary-Grove High School Friday October 18, 2013. 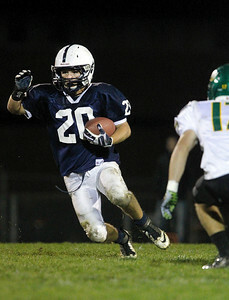 Cary-Grove won the game 21-14.